Vietnam’s shrimp exports are expected to reach more than US$4 billion in value this year aided by free trade agreements. The Vietnam Association of Seafood Exporters and Producers (VASEP) last week said the country was unable to meet its 2018 export target of US$4.8 billion, hitting only US$3.5 billion – a 7.8 percent decrease from 2017. However, the implementation of the EU-Vietnam Free Trade Agreement (EVFTA) and other free-trade agreements later this year is expected to boost exports to 28 European Union (EU) countries – for an expected value of US$1 billion. 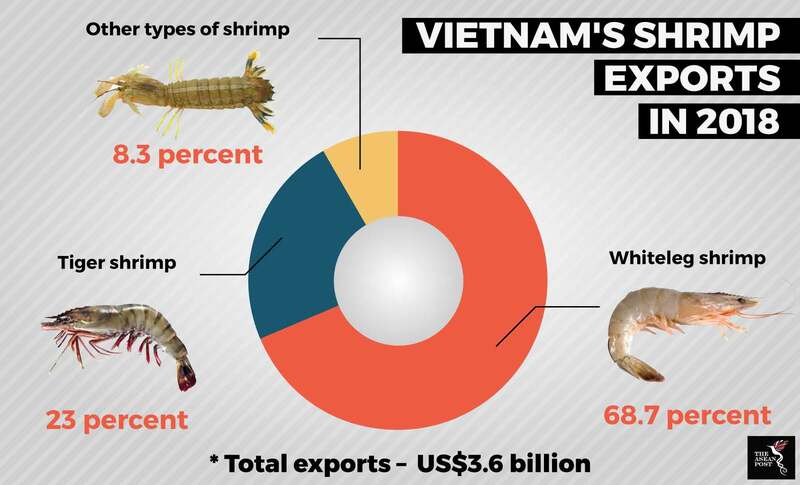 The EU was Vietnam’s largest market for exported shrimp last year, accounting for 23.6 percent of all exports with a value of US$838.3 million. Shrimp exports are so profitable in Vietnam that many small rice farmers in the Mekong Delta switched to shrimp farming some 15 years ago. In so doing, they inadvertently did irreparable damage to the delta. Intensive shrimp farming, as the practice is called, involves clearing away large tracts of mangrove trees. In their place earthen tarpaulin-lined ponds are created and filled with brackish water. The resulting deforestation exposes the coastline to erosion and the shrimp farms to storm surges, strong winds and typhoons. Farmers also pump out groundwater to fill their ponds. This causes the land to subside and allows seawater to encroach further up the delta and damage rice crops. Subsidence is the most immediate threat to the Mekong Delta, said Tran Thuc, vice chairman of the government’s advisory panel on climate change at a conference in September 2017. The delta sank five to 10 centimetres between 2010 and 2015 while erosion has taken away 300 hectares of land since 2005. The Mekong Delta may disappear within the next 100 years, government officials warned. Wastewater after every harvest is often discharged into the waterways without any treatment. This contaminated water is pumped up and used by other farmers. Chemicals have to be added to remove organic matter from the water. To keep shrimp healthy, antibiotics and supplements are added. Some of these antibiotics are banned but continue to be used. This has prompted Japan to sample every shipment of shrimp from Vietnam instead of the usual 30 percent from other countries. VASEP expects shrimp farming to take up 710,000 hectares of land by 2020 and 750,000 hectares by 2025. Total shrimp output is predicted to hit 850,000 tonnes by 2020 and 1.15 million tonnes by 2025. To enhance competitive capacity for Vietnamese shrimp and reduce damage to the environment, the Ministry of Agriculture and Rural Development is pushing to encourage eco-farming and large-scale industrial-level farming for shrimp, while phasing out the use of chemicals and antibiotics. Eco-farming is targeted at small scale farmers and aims to cultivate shrimp in rice fields and mangrove areas. The International Union for Conservation of Nature (IUCN) started a project in 2013 called Mangroves and Markets. Farmers are trained to rear shrimp in mangrove-forested waterways away from the Mekong River system. The shrimp grow as they would in nature, along with other marine edibles such as cockles, clams and oysters. The trees help maintain salt levels, hold back sediments and protect the farms from erosion. Farmers also save on costs: shrimp feed is unnecessary as food is readily available naturally; no water treatment, antibiotics and supplements are needed and the risk of disease is minimal. This method is easy to manage and less laborious. The products are certified organic by Naturland, a German certification body. Eco-shrimps yield a quarter of the harvest from intensive shrimp farms but operate at half the cost, said Dinh Xuan Lap, vice director of the International Collaboration Centre for Aquaculture and Fisheries Sustainability. However, each kilogram of organic shrimp fetches US$0.86 to US$1.30 more than industrial shrimp, he added. As of 2016, over 2,000 farmers have been certified as organic shrimp producers and another 3,000 are expected to be trained and certified by the end of 2019. Eco-shrimp farming has created more than 700,000 jobs in the Mekong Delta, Lap said. To date, integrated mangrove-shrimp farms occupy an estimated 50,000 hectares of land. The Bac Lieu province alone has over 120,000 hectares of eco-shrimp farms and “improved extensive” shrimp farms, said Duong Thanh Trung, chairman of the province’s People’s Committee. The IUCN said integrated mangrove-shrimp farms are the most realistic solution for the environment of the Mekong Delta and the long-term financial stability of the region’s small-scale shrimp farmers. For large scale shrimp farming, the IUCN recommends doing so on a very large, industrialised scale in areas that do not require mangrove coverage. The Vietnam-Australia JSC (or Viet Uc) is pioneering a super-intensive method by farming in greenhouses under tightly controlled conditions. It has invested US$7.7 million on a 50-hectare farm that yields up to 300 tonnes of shrimp per hectare a year, which is over 10 to 15 times higher than traditional methods. The IUCN said several large state-owned and private corporations along the Mekong coastline currently hold 15- or 20-year investment licences and is working on persuading them to adopt glasshouse production methods. VASEP projects revenue from shrimp products to reach US$10 billion in 2025. It seems like industrial scale shrimp farming appears to be the way to go. This article was first published by The ASEAN Post on 28 July 2018 and has been updated to reflect the latest data.